Poolside cottage with kitchenette and cable TV, VCR and telephone. Double french doors open onto private patio overlooking pool. Queen four-poster pineapple bed, sitting area, private bath. We have rooms with French doors that open onto the patio overlooking the pool. 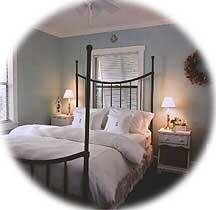 Queen four-poster beds and private baths, cable TV, telephone and refrigerator. Some include Private entrance. This charming house built in 1921 is the latest addition to the Mango Inn Bed & Breakfast. 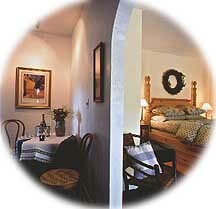 The Little House is ideal for stays of a week or more. Approximately 1, 200 square feet, this two bedroom, two bath home with hardwood floors, fireplace, family room, livingroom, dining room, full kitchen, washer & dryer and screened in patio. From I-95 I-95 to Southern Boulevard. Left (east) on Southern Boulevard. Drive approx 2 miles. (You will cross over the Intracoastal Waterway.) After you cross over the bridge, stay in the RIGHT lane at the turnabout in the road. You are now on A1A. Stay on A1A south to West 802 (approx 5 miles). Turn right onto 802 and go over the bridge. Turn right on North Palmway (third street). Proceed to stop sign and turn right. Go to next block (North Lakeside Drive). Turn right. The inn is on the immediate left. From Florida Turnpike Take the Lake Worth exit (Exit 93). Go east approximately 7. 5 miles to Federal Highway. Left on Federal to the second light (2nd Avenue North). Turn right at 2nd Avenue. Turn right at the FIRST street past the stop sign (North Lakeside Drive). The inn is on the immediate left.